The mural, painted over fours walls, took 17 days to paint. Any quote for similar work would be based upon a similar timeframe for the work, depending on the size etc. For this bedroom in a home in central London, The client asked me to create different scenes from Harry Potter for their two boys, featuring a panorama of Hogwarts at night, a colourful twilight scene of Diagon Alley, and a bright, daytime Quidditch match. There was also a space to add in the Great Hall in Hogwarts, with floating candles, and Dumbledore sitting it the top table. The logistics included painting a fitted wardrobe, some fitted bunk beds, two doors and frames and negotiating three large windows. The budget was fixed and so was the amount of time available to do the work, which was quite short so I was under quite intense time pressure while painting. The work was completed exactly on schedule and the clients, and especially her two boys, were absolutely thrilled with the result. Like all of my completed murals, it was finished off with a coat of barely visible flat matte varnish and, because it's a whole room, once again there are lots of photos. I hope you like them. Harry Potter Mural painted around boys' bedroom, includes Hogwarts from the lake in moonlight at night, with the first year initiate wizards and witches arriving by magic boats, also Hedwig the Owl, then Diagon Alley, a game of Quidditch seen from the players' perspective, the golden snitch, and the Great Hall at Hogwarts, complete with floating candles. Harry Potter Wall Mural - Hogwarts from the lake, with the first year initiate wizards and witches. 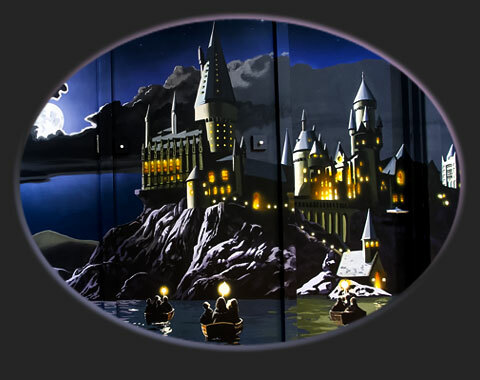 Mural of Hogwarts, Harry Potter, from the lake in moonlight, making the most of the space by concealing the doors and frames. Harry Potter Hogwarts mural shown here straight on. Harry Potter mural showing some somewhat shady characters and more details. Harry Potter mural Quidditch match seen from the players' perspective. Photographed here under bright halogen lights, the colours look particularly intense. Also, this wall was painted last with a speed painting method to make sure I would finish on time, the whole wall including the drawing was done from start to finish in two days. Quiditch match in full swing in this part of the mural, which maximizes the available space around the blacked out windows..
Malfoy stalks Harry Potter in quidditch game painted on this part of the room. Very close up shot shows the loose technique used for this last wall, the whole of which was painted in just two days, to meet a deadline. When you pull back a bit the effect works quite well. Harry Potter himself makes an appearance in this part of the Quidditch mural. Nice photo, shows the mural looking very different with bright sunlight streaming in. Harry Potter wall mural "Hogwarts Express" fitted bunk beds. The Great Hall with floating candles, seen through a window from outside, and the solution to the join between the night and day scenes. The stickers were left at the client's request. How it all fits together, with the dark black clouds and Great Hall exterior requested by the client to create a dark space for sleeping. Harry Potter wall murals in boys bedroom with the blackout blinds down, in halogen light. ...and the last one. With painted sockets, again at the request of the client. Another detail - some pesky piskies. View into the room through door with mural painted up to leading edge. Harry Potter Muralpainted around boys' bedroom, includes Hogwarts from the lake in moonlight at night, with the first year initiate wizards and witches arriving by magic boats, also Hedwig the Owl, then Diagon Alley, a game of Quidditch seen from the players' perspective, the golden snitch, and the Great Hall at Hogwarts, complete with floating candles. The mural, painted over fours walls, took 17 days to paint. Any quote for similar work would be based upon a similar timeframe for the work, depending on the size etc. Of course you may qualify for a discount.